Specifically known as ethylene propylene diene monomer, EPDM, has been and still is to this day a major commercial roofing product in the real estate industry for keeping buildings dry. 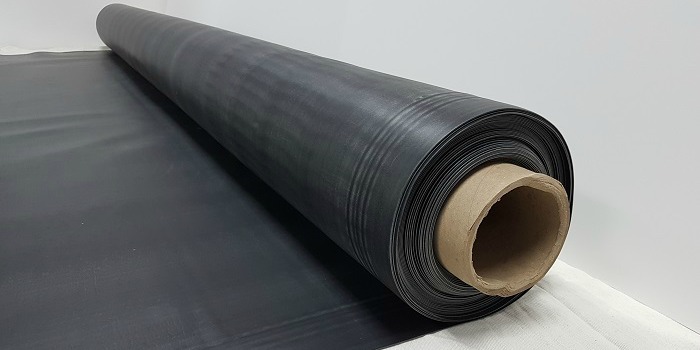 It has been a dominate membrane in the single ply market around the country for many years and although TPO and its white reflective surface have taken a good bit of market share from EPDM, this typically black rubber membrane is still for many, a “go-to” roofing product. Many influential markets such as commercial, government, hospitals, and education buildings all have long standing use of EPDM. Like previously stated, EPDM is traditionally black in color and the simplest way to describe EPDM is that it is a flat sheet of rubber. It can be made as a reinforced membrane or a non-reinforced membrane. For a roofing membrane to be reinforced, it means that fabric/scrim is manufactured inside the layers of rubber. This creates added strength for certain installation areas, especially to prevent tearing of the membrane during installations that are mechanically attached roof systems. If a roof system is fully adhered or ballasted in its securement, PSR typically prefers a non-reinforced membrane as do many roofing manufacturer’s reps.
EPDM is an easy product to handle, maneuver around penetrations and wrap special areas with. Once laid out, it’s seams are adhered together using an EPDM primer and a ‘peel n stick’ / seam tape product. This is a very simple and reliable way to seal the seams and prior to this seam adhesion process, proper cleaning of the membrane area is key. Contractor’s can buy membrane with factory applied seam tape already on rolls now. The standard thicknesses for EPDM come in 45 mil, 60 mil, and 90 mil membranes. Rolls typically installed are 10 ft wide in nature however for large wide open roofing projects, some contractor’s may elect to go with a 20 ft wide roll of membrane so that less seams are needing to be sealed thus creating faster installation time and less leak sources. Many contractor’s say that when an EPDM roof system is at its life expectancy, it is not because of the EPDM failing because it is only rubber. The main sign of an EPDM system failing is when the seams and penetrations start coming loose. Occasionally weathering and sun can dry out the rubber membrane causing it to be brittle and tear easily as well. In recent market trends, EPDM has been installed less and less in the south due to its high ‘heat’ attraction nature with its black surface. In in the north however, EPDM still is in use a great deal. Roofing manufacturer’s have started to make white EPDM to compete with TPO white membranes and they are great systems to consider for some owners. From a price point, EPDM is more expensive than TPO due to the amounts of accessories and adhesives, primers, and cleaners needed. One price point where EPDM can compete better with TPO is in the application nature for a roofing project itself. A building with an existing EPDM building and ballast river rock on it may elect to go with a “re-ballast” or “re-skin” of the existing ballasted EPDM membrane by simply pushing the rock aside and swapping out the EPDM membrane with new. The main point in considering EPDM is that it opens contractor’s and building owners up to different applications which may fit better than other types. Overall, EPDM is a terrific product in the commercial roofing industry. It should always be expected to have a solid strong hold for certain buildings across the country and as commercial roofing always makes advances, EPDM will be reliable option for many years to come.